The 2018 National Shared Use Mobility Summit featured an unprecedented number of attendees and speakers. Even if you missed out on the panels, workshops, Start-up Spotlight, expo, and networking, you can still enjoy the plenary sessions, which were recorded by the Overhead Wire. See below for links to each of the sessions, as well as the names of the panelists in speaking order. 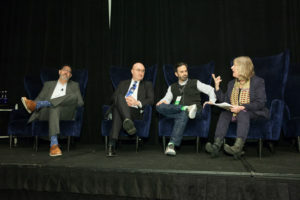 Shared Mobility Summit, 2018. l to r: Jay Walder, Jarrett Walker, Gabe Klein, and Sharon Feigon. 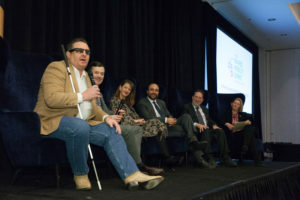 Listen to the 2019 Shared Mobility Summit Key Note and Plenaries here.